Stay up late, bundle up and gaze upward to witness one of the best, most exciting natural phenomena known to mankind! Fairbanks’ renowned aurora borealis viewing lures people from all over the world during the “Aurora Season” from August 21 to April 21. Why is this? How can a sub-arctic community in the middle of Alaska be so naturally accommodating to dancing green bands, flashy magenta rays, and curtains of colorful moving waves? Because SCIENCE, of course! Fairbanks’ location is ideal for northern lights viewing because it is under the “Auroral Oval,” a ring-shaped zone over the far north where aurora activity is concentrated. Additionally, Fairbanks’ low precipitation and distance from coastal areas contributes to consistently clear nights. All combined these variables make the Fairbanks region an outstanding destination for possible aurora borealis viewing. Scientifically speaking, the aurora is dancing above year-round, but we can only see it during the Aurora Season, when we have dark enough skies. While the best time to view the aurora is generally between midnight and 3:00 a.m., if the factors are lined up for a show, the lights should be present between 90-minutes after sunset to about 90-minutes before sunrise. 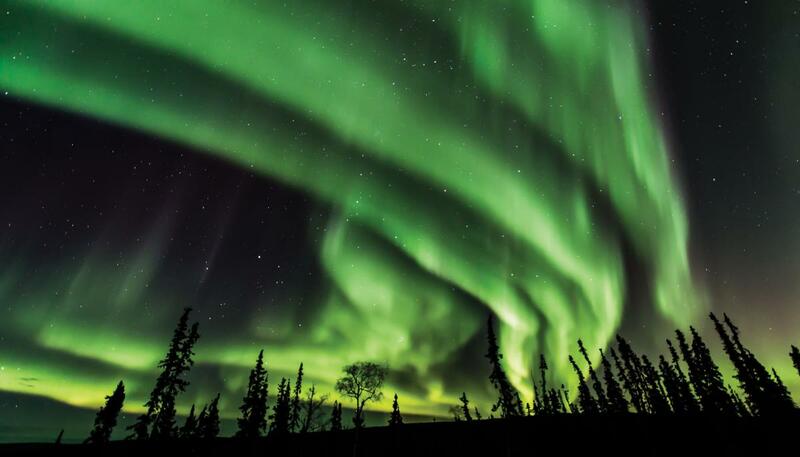 The aurora will be visible in Fairbanks an average of four of five nights when the sky is clear and dark enough. We are in the center of it all here in Fairbanks, with the University of Alaska Geophysical Institute conducting extensive research on the northern lights. Their forecast data is one of the factors we correlate (along with weather and daylight) to make predictions with our real-time Aurora Tracker. In fact, the northern lights are so prolific in the Fairbanks region and the Arctic that visitors who stay a minimum of three nights and are actively out during the late evening hours increase their chance of seeing the aurora to more than 90 percent. Our community is so committed to getting visitors to view the show that most local accommodations will offer to wake you up if the aurora is on display! Fairbanks is lucky enough to be the home of Neal Brown, a retired rocket scientist and continuing aurora science enthusiast, who has lived in Fairbanks for the past 50 years. We are also fortunate because he likes to explain the aurora so people understand the science behind it, even if you aren&apos;t a rocket scientist yourself! THE AURORA has a curtain-like shape, and the altitude of its lower edge is sixty or seventy miles, about ten times higher than a jet aircraft flies. AURORAS OCCUR along ring-shaped regions around the north and south geomagnetic poles. Did you know? The southern aurora, near the South Pole is aurora australis. LIKE A NEON SIGN, auroral light is produced by a high-vacuum electrical discharge. It is powered by interactions between the sun and earth. The light glows from atoms and molecules in the earth&apos;s upper atmosphere. THE SUN IS a ball of gases that is so hot its outermost part blows away as solar wind consisting of charged particles. This tenuous gas travels to earth in about two days. Because the earth&apos;s magnetic field prevents the solar wind from penetrating our atmosphere, its solar particles stream around our planet, encasing earth and its magnetic field within a comet-shaped cavity called the magnetosphere. THE SOLAR WIND powers the gigantic electrical discharge process, causing the magnetosphere to behave as a generator that produces up to ten million megawatts of electrical power. THE UPPER ATMOSPHERE contains, at the lower edge of the aurora, a thin and partly ionized layer called the ionosphere. Reflected by the ionosphere, radiowaves can propagate great distances by bouncing between it and the ground. AURORAL DISPLAYS INDICATE that the ionosphere and our protective atmosphere are being energized by the electric power generated in the magnetosphere. As these electrical currents are discharged in the ionosphere.Many phenomena are produced including the visible emissions we recognize as the aurora and magnetic storms. So, this winter during Aurora Season, make a point of bundling up, staying out late, and chasing the magnificent and magical show called the northern lights! Neal Brown&apos;s Website - Alaska Science Explained! 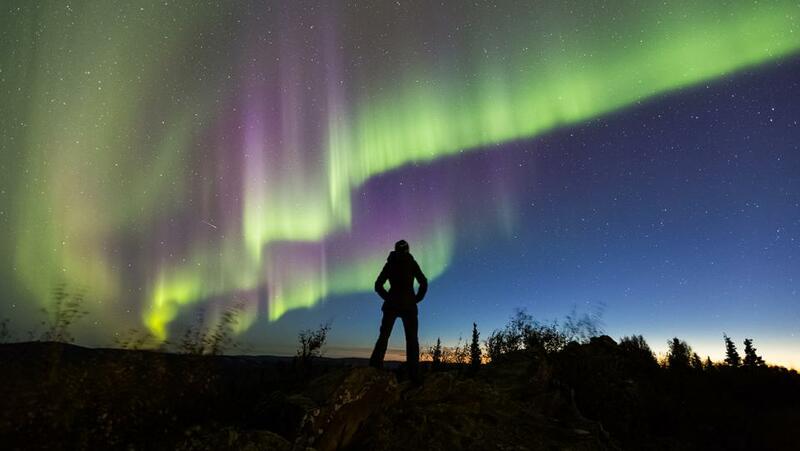 Travel + Leisure and Smithsonian Magazines both call Fairbanks the best place to view the northern lights in the U.S.